C-COM tests phased array system for KA-band antenna. Ottawa, June 2018: C-COM Satellite Systems Inc., the leading global provider of mobile auto-deploying satellite antenna systems, has announced that it has successfully tested its 16x16 subarray phased array antenna using 4x4 Transmit and Receive building blockmodules. The panels were developed and tested at the Centre for Intelligent Antenna and Radio Systems (CIARS) at the University of Waterloo. The primary goal of the research project is to focus on the development of a new modular, low-cost, intelligent and conformal Ka-band antenna for the next generation mobile satellite communications. 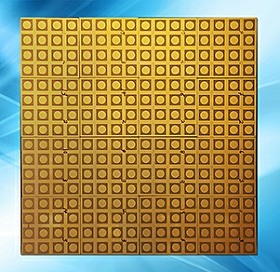 The now proven modular approach allows antenna designers to develop any size and shape of phased array panels using the smallest intelligent active 4x4 subarray. “We are pleased to have reached this important milestone in our development of a fully electronically steered Phased Array Mobile Satellite Antenna operating in Ka-band,” said Bilal Awada, CTO of C-COM Satellite Systems Inc. “The antenna will be able to track multiple satellites simultaneously and operate on the latest LEO, MEO and GEO constellations,” added Awada. Professor Ali Safavi-Naeini, Director of CIARS, is in charge of the research team at the University of Waterloo responsible for this project. “Measured lab results have demonstrated the high performance of the small modular scalable intelligent Transmit and Receive antenna modules and validated our simulation model for larger panels,” said Safavi-Naeini. “We also achieved good beam steering up to 70 degrees from boresight, a significant achievement,” Safavi-Naeini continued.